Punjab 1984, a historical drama action movie based on true facts, dedicated to thousands of those mothers who lost their sons. Punjab 1984 is set in the backdrop of 1984 Punjab, when the state was going through a terrible time of terrorism. Film is directed by talented man of Film Industry Anurag Singh who has directed comedy movies like Jatt and Juliet, Jatt and Juliet 2 and Disco Singh taking Diljit in lead earlier, this time he comes with a totally different concept based on a very serious matter of Sikh's history. 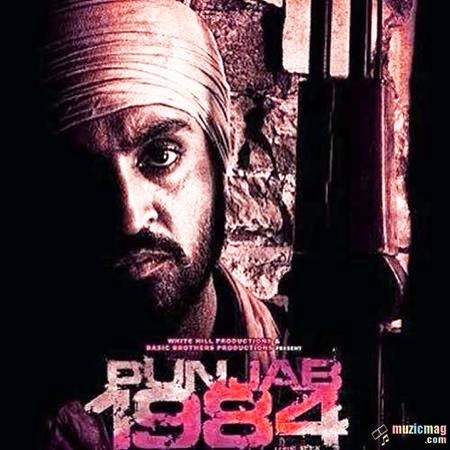 Punjab 1984 is a beautiful attempt by Anurag Singh to show the facts of Sikh Genocide 1984. The film is not purely based upon Sikh Genocide 1984, If they had done so, movie would have been banned in India like the previous historical dramas 'Sadda Haq' and 'Kaum De Heere'. It has been presented intelligently concentrated on a mother and son while keeping all the circumstances of 84 realistic. On one side where it depicts the barbarities and torture of Police, Khalistani militants also appears killing Hindus, planting bombs in buses to kill common people. Diljit Dosanjh has again proved his acting skills. Kirron Kher, who played the role of mother of Diljit , deserves a special mention, She is outstanding in her role. Female lead, the innocent girl 'Sonam Bajwa' and 'Rana Ranbir' have done a good job as their supporting roles. Role of Villain is also admirable. Review 2: What a movie...truly a zenith of Punjabi Cinema !! The way director handled the sensitive issue is just commendable alongside some brilliant performances from all the actors, specially to mention about Kirron Kher who portrayed a typical mother with all the essence intact. Diljit also showing his acting skills unlike his image of that funny Jatt !!! And last but not the least the story n screenplay of Anurag singh with all the important incidences of that black era n a beautiful message that a common man has nothing to do with so-called inqlab or the dividings...he just wants to live happily in his village, spend life with his parents and roam in the streets of his village without any fear...but the dilemma is that some people sitting on the top never let him be happy just because of their own selfish reasons !! !